We were all crazy about spinach in my family when I grew up. 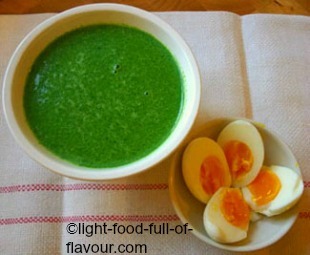 Among other things, my mother used to make spinach soup served with hard-boiled eggs. 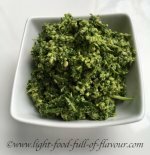 It was my ultimate spinach favourite and something I always used to ask for when I came back to visit after I had moved out. I’m the one who cooks for my mother now when I go back to visit her and my versions of her spinach dishes are more slim-line. A lot of traditional Swedish dishes tend to include a fair amount of cream, something my mother was very quick to add to a lot of things. It is a milk-based soup though, and there is a bit of butter involved. I use semi-skimmed milk for my spinach soup and if you want to, you can replace some of the milk with water. This spinach soup is relatively quick to whip up and it’s filling and nourishing. I love to eat it together with a big side-salad. I’m greedy when it comes to this particular soup, but this should be enough for four people who are not as greedy as I am. 1. Start by putting the fresh spinach in a colander and slowly pour over a kettle of boiled water to wilt the spinach. Rinse with a lot of cold water immediately afterwards. When the spinach is cold, squeeze out as much water as possible with your hands. Finely chop the spinach and leave to the side. 2. Boil the eggs. I add the eggs to boiling water and boil them for 8 minutes before rinsing them with a lot of cold water to stop them from cooking further. Peel the eggs, cut each egg in half and leave to the side while you make the soup. 3. Melt the butter in a large saucepan over a low heat. Whisk in the flour until you have a smooth paste and then slowly add the milk while continuing to whisk. Increase the heat a little bit and bring to the boil, then lower the heat and simmer for 10 minutes. You have to keep whisking or it will burn at the bottom of the pan. 4. Turn off the heat, add the spinach and either blend the soup with a stick blender in the pan, or let the soup cool down to room temperature and use an ordinary blender (you will have to do this in batches) and then return the soup to the pan. Season with salt, pepper and a good pinch of nutmeg. If you find the soup to be too thick, just add some more milk or water (I like this soup to be quite thick). Reheat and serve with at least 2 egg halves in each soup bowl.